By 1865 Nicolay had worked for Mr. Lincoln as his secretary for nearly five years and had a front row seat for the personal and political affairs of his boss and the nation. 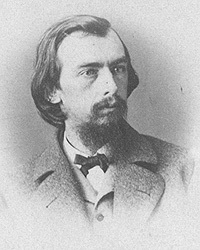 He wrote Therena: “I think that I do not yet, and probably shall not for a long while, realize what a change his death has wrought in my own personal relations and the personal relations of almost every one connected with the government in this city who stood near him…..”4 Four days earlier, Nicolay had resigned his office – although with his colleague John Hay he continued to organize the papers of the assassinated President. In early June 1860 Nicolay had written Therena: “Mr. Lincoln has engaged me to act as his private secretary during he campaign, and pays me at the rate of $75.00 per month for the service. Of course that will keep me here until the next November election. He has a room here in the State House, and so I go right along with any change of quarters or arrangements of any kind other than that indicated.”5 At the time Nicolay was working for Illinois Secretary of State Ozias M. Hatch. And the particulars if he will give them. And if so, how soon must it be had? Michael Burlingame, editor, With Lincoln in the White House: Letters, Memoranda, and Other Writings of John G. Nicolay, 1860-1865, p. 178 (Letter to Therena Bates, April 24,1865). Michael Burlingame, editor, With Lincoln in the White House: Letters, Memoranda, and Other Writings of John G. Nicolay, 1860-1865, p. 177 (Letter to Therena Bates, April 17, 1865). Rufus Rockwell Wilson, editor, Lincoln Among His Friends: A Sheaf of Intimate Memories, p. 69 (Thomas Hall Shastid, Nation, February 20, 1929). Michael Burlingame, editor, With Lincoln in the White House: Letters, Memoranda and Other Writings of John G. Nicolay, 1860-1865, p. 178 (Letter to Therena Bates, April 24, 1865). Michael Burlingame, editor, With Lincoln in the White House: Letters, Memoranda, and Other Writings of John G. Nicolay, 1860-1865, p. 1 (Letter to Therena Bates, June 6, 1860). Helen Nicolay, “A Candidate in His Home Town”, The Abraham Lincoln Quarterly, September 1940, p. 133. Michael Burlingame, editor, With Lincoln in the White House: Letters, Memoranda, and Other Writings of John G. Nicolay, 1860-1865, p. 6-7 (Memorandum, October 16, 1860). Helen Nicolay, “A Candidate in His Home Town”, The Abraham Lincoln Quarterly, p. 137 (September 1940). Helen Nicolay, “A Candidate in His Home Town”, The Abraham Lincoln Quarterly, September 1940, p. 140. Michael Burlingame, editor, William O. Stoddard, Inside the White House in War Times, Memoirs and Reports of Lincoln’s Secretary, p. 57. Michael Burlingame, editor, William O. Stoddard, Inside the White House in War Times, Memoirs and Reports of Lincoln’s Secretary, p. 157 (New York Citizen, Sketch 4). Michael Burlingame, editor, With Lincoln in the White House: Letters, Memoranda, and Other Writings of John G. Nicolay, 1860-1865, p. 15 (Letter to Therena Bates, December 9,1860). Michael Burlingame, editor, With Lincoln in the White House: Letters, Memoranda, and Other Writings of John G. Nicolay, 1860-1865, p. 114 (Letter to Therena Bates, May 17, 1863). Michael Burlingame, editor, With Lincoln in the White House: Letters, Memoranda, and Other Writings of John G. Nicolay, 1860-1865, p. 141 (Letter to Therena Bates, May 15, 1864). Michael Burlingame, editor, With Lincoln in the White House: Letters, Memoranda, and Other Writings of John G Nicolay, 1860-1865, p. 167 (Letter to Therena Bates, Decenber 16, 1864). Michael Burlingame, editor, With Lincoln in the White House: Letters, Memoranda, and Other Writings of John G. Nicolay, 1860-1865, 1860-1865, p. 55 (Letter to Therena Bates, September 8, 1861). Michael Burlingame, editor, With Lincoln in the White House: Letters, Memoranda and Other Writings of John G. Nicolay, 1860-1865, p. xvi. 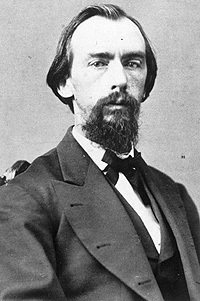 Rufus Rockwell Wilson, editor, Lincoln Among His Friends: A Sheaf of Intimate Memories, p. 161-162. Carl Sandburg, Abraham Lincoln: The War Years, Volume II, p. 297. Michael Burlingame, editor, With Lincoln in the White House: Letters, Memoranda, and Other Writings of John G. Nicolay, 1860-1865, p. 127 (Letter to Therena Bates, February 21, 1864). Michael Burlingame, editor, With Lincoln in the White House: Letters, Memoranda, and Other Writings of John G. Nicolay, 1860-1865, p. 174 (Letter to Therena Bates, February 10, 1868). Michael Burlingame, editor, With Lincoln in the White House, p. 60 (Letter from John G. Nicolay to Abraham Lincoln, October 21, 1861). Charles M. Hubbard, editor, Lincoln Reshapes the Presidency (William C. Harris, “Lincoln’s Role in the Presidential Election of 1864″), p. 189. Michael Burlingame, editor, With Lincoln in the White House, p. 60 (Letter from John G. Nicolay to Therena Bates, April 17, 1865).